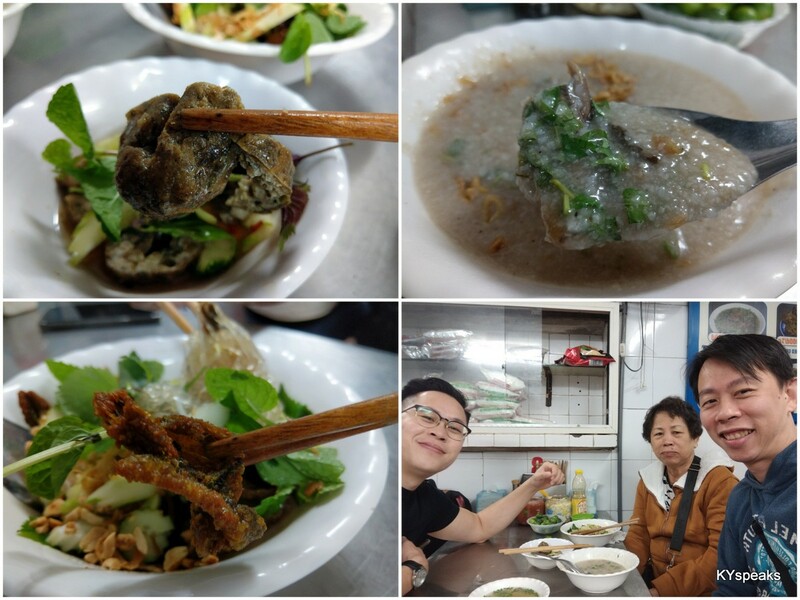 Growing up on an island and having relatives who were fishermen definitely does instill some love for seafood in me from a young age. 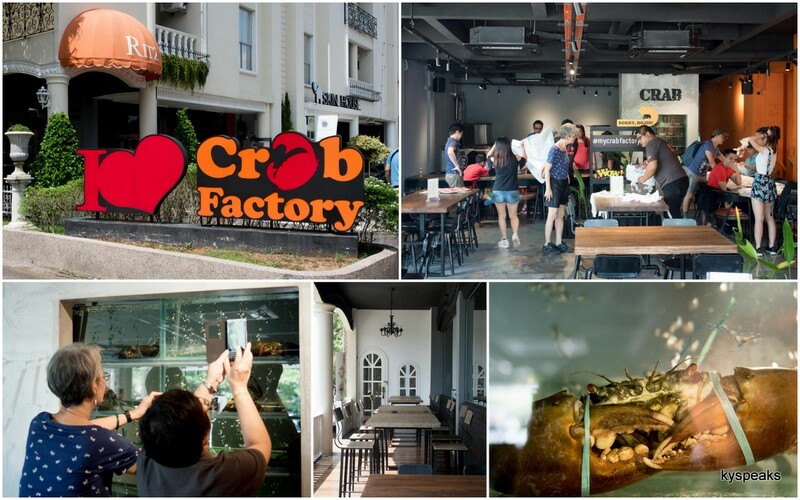 Hence, Crab Factory being one of our destinations for the short food trip to Johor Bahru definitely helped encouraged me to participate in this fun little blogger get-together. I’ve been to the original Crab Factory outlet at PJ SS2 about a year prior and enjoyed the experience tremendously, so the expectation was certainly up there for this visit down south. The restaurant is located at Little Paris, JB’s attempt at replicating the famous city in France with tastefully thought out architecture, I must say overall the small development area looks rather neat. 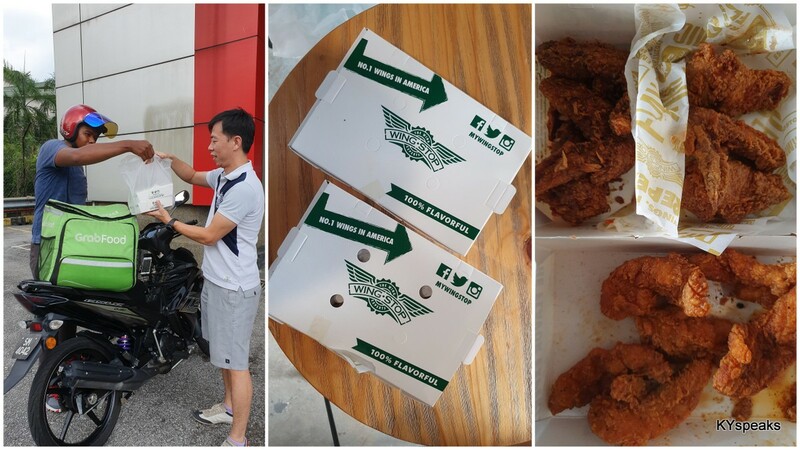 For the afternoon, we sampled three different sauces – Signature Southern Bang, Creamy Lemak, and seemingly flavor of 2017 for many dishes these days – Salted Egg. 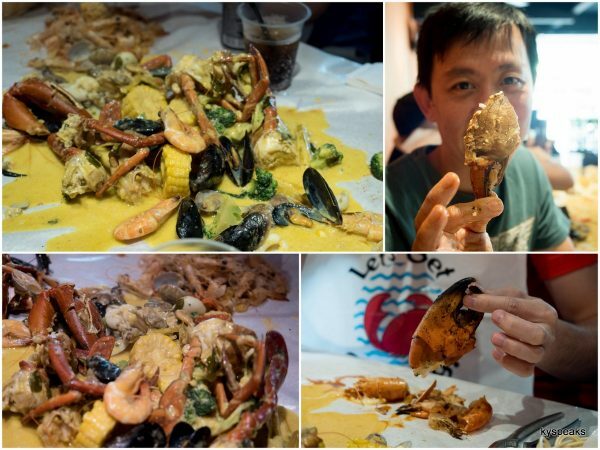 For those who hasn’t tried the Louisiana style seafood dining before, the experience can be quite fun. Your seafood is basically poured directly on the table and you use your bare hands & fingers to dig in. There’s no bowls, plates, or forks & knifes, but thankfully, a little hammer & clamp is provided for those pesky crab claws. 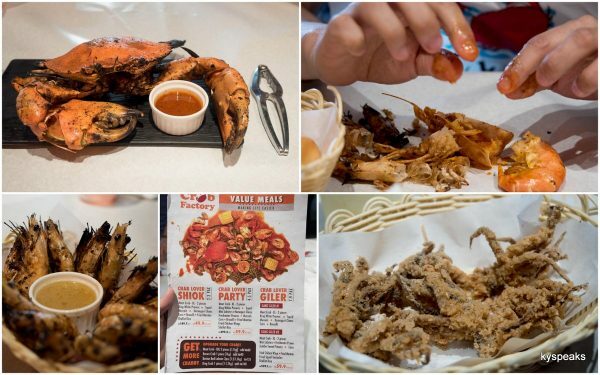 As for pricing, there are 3 different value meals to choose from – Crab Lover Shiok (2-3 pax), Crab Lover Party (4-5 pax), and Crab Lover Giler (7-9 pax) priced at RM 49.90 or RM 59.90 per pax. Pretty decently priced for the experience and premium ingredients I thought. Having sampled all three sauces, I find myself gravitate towards the classic Southern Bang, with it’s cajun spice, lemon, garlic, and herbs contributing just enough to the fresh seafood. 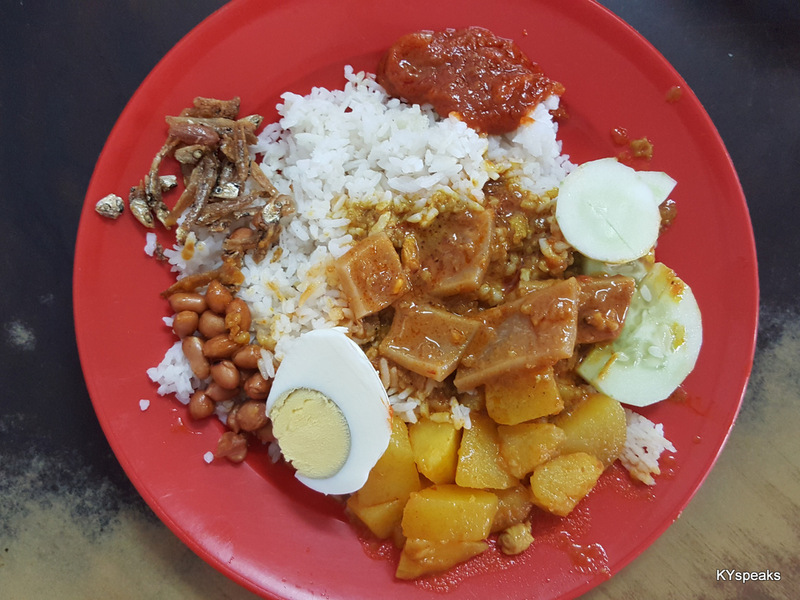 Creamy Lemak makes for good sauce base if you love to have some deep friedmantao with. As for the Salted Egg sauce, well, could perhaps be a bit stronger to give it that extra kick. To be honest though, I also kinda missed the original butter garlic sauce, of course you could order yours that way. 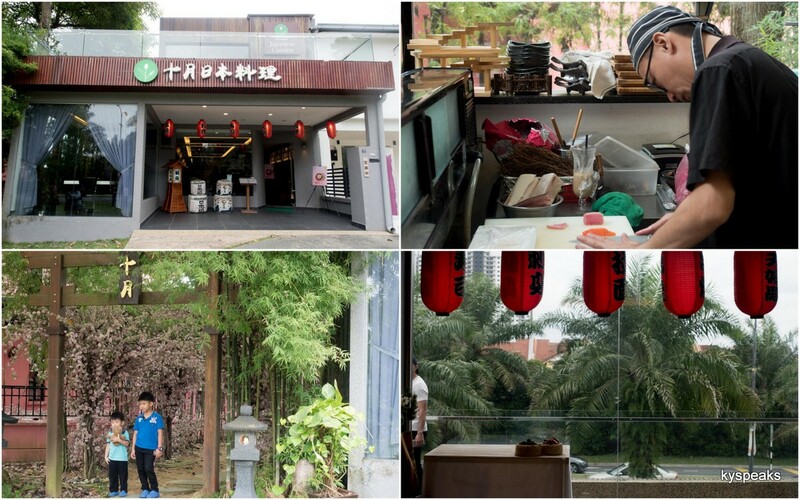 A couple weeks ago I was invited to a short weekend trip to Johor by some blogger friends. 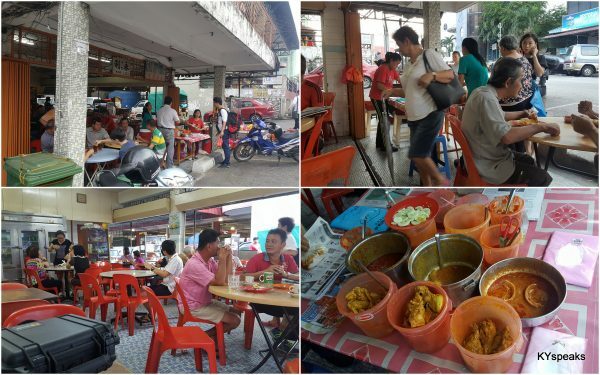 I gotta admit that I’m absolutely not familiar with the food scene in JB, having only been there a few times mainly for work where mobility for meals is pretty restricted. 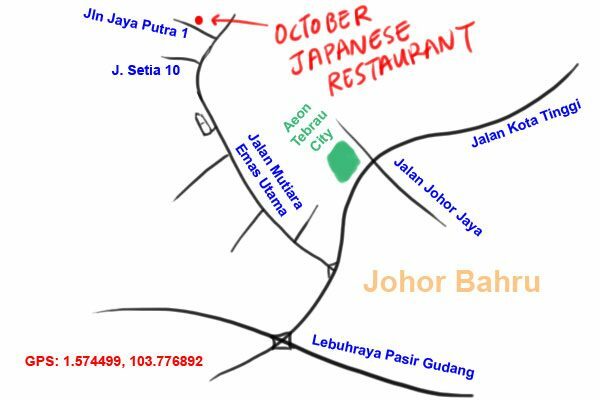 Our first destination of the trip was October Japanese Restaurant, located near Mount Austin, a more upscale area in Johor Bahru. The restaurant is a converted residential unit with nice lush lawn and plenty of parking spots at the back. 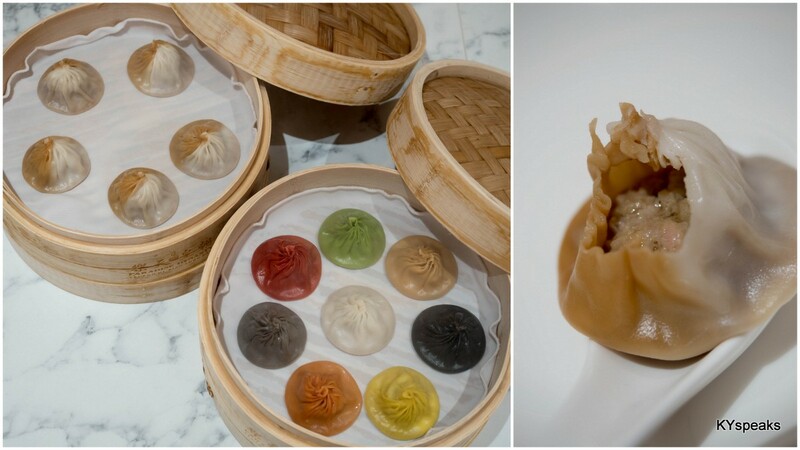 While we may still be in December, October Japanese Restaurant already came up with their Chinese New Year dishes, and we were lucky enough to sample some of them. 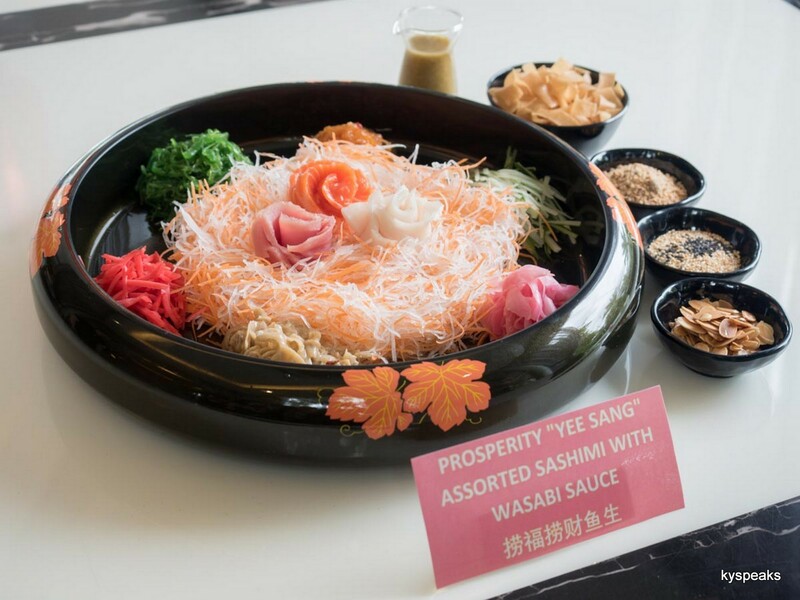 We started out with the Prosperity “Yee Sang” Assorted Sashimi with Wasabi Sauce (RM 68/RM 108 nett) that came with generous slices of – Norwegian Salmon, Maguro (Tuna) and Hamachi (Yellow Tail). They’ve also added fried Gyoza Skin and Roasted Almond Flakes to give the dish more crunchiness. 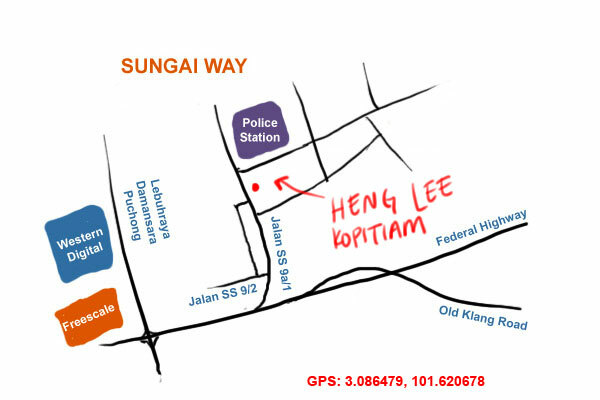 A good alternative to consider for your “lou sang” session. 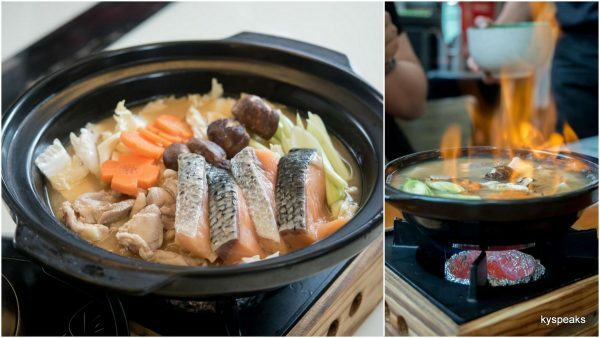 Then there’s the Auspicious Flaming Nabe (RM68.80 nett), with Norwegian Salmon and chicken breast mixing in with Shitake mushrooms, leeks and carrots to make a pretty sweet tasting miso based soup. Generous amount of “KaoLiang” Rice Wine and sake were used in this pot as well, which contributes to the whole flaming spectacle. 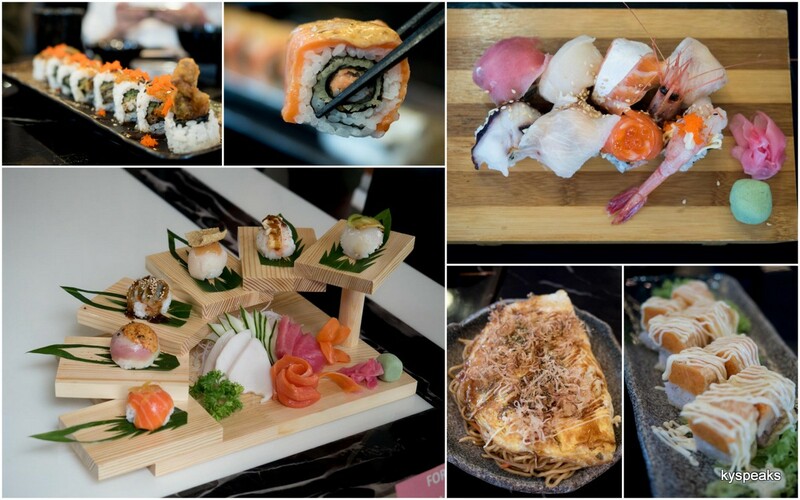 For those who likes it raw, there’s the Fortune Sushi & Sashimi Platter (RM58.80 nett). The dish is beautifully presented on a wooden platter and came with rather generous amount of fresh seafood including Maguro, Hamachi, Unagi, and Salmon. We also tried the Flaming Salmon Aburi Maki (RM29.90++), with salmon and special crab stick plus spicy sauce. Grilled Edamame (RM9.90++) is a good starter if you like your edamame with a kick, which I think will go really good with beer. 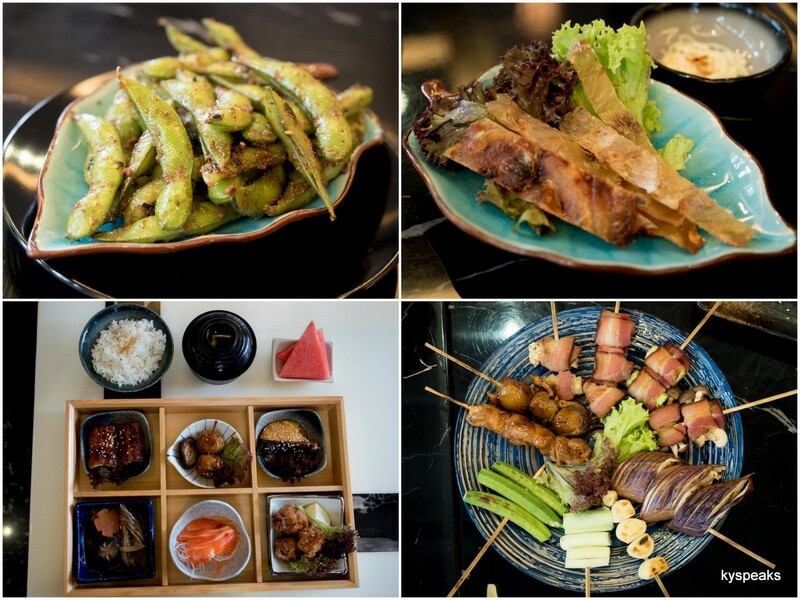 For those who likes bento, October Special Bento (RM59.90++) is a worthy option and comes with a little bit of everything, including salmon sashimi, unagi, and more. And if you like it grilled, Kushiyaki Moriawase (RM44.90++) comes with scallops, Shitake Mushroom, Enoki Niku Yaki and other greeneries on skewers, and you’ll also find bacon in this platter as well, which makes this one of the few non-halal Japanese Restaurants in JB. 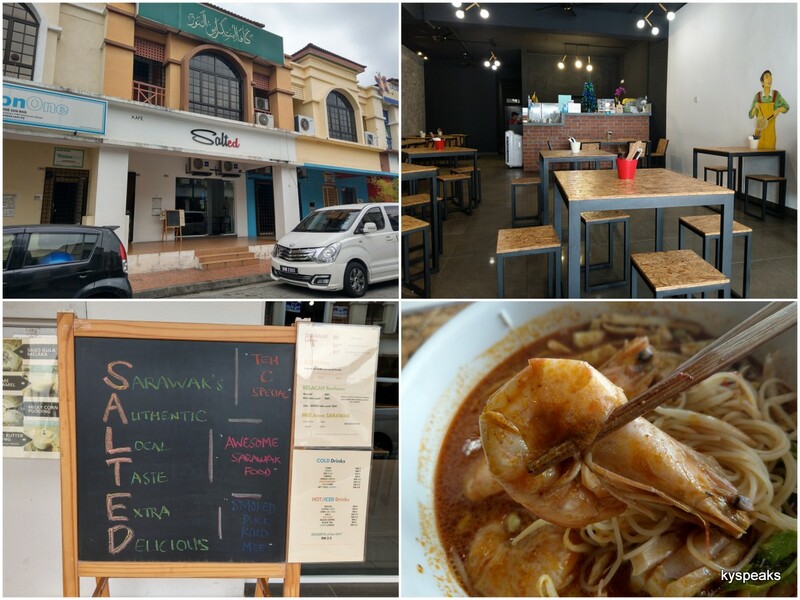 Sarawak Laksa seems like the flavor of the year, so before the end of 2017 I decided to give yet another highly recommended Sarawak Laksa place a try – SALTed at Mutiara Damansara. 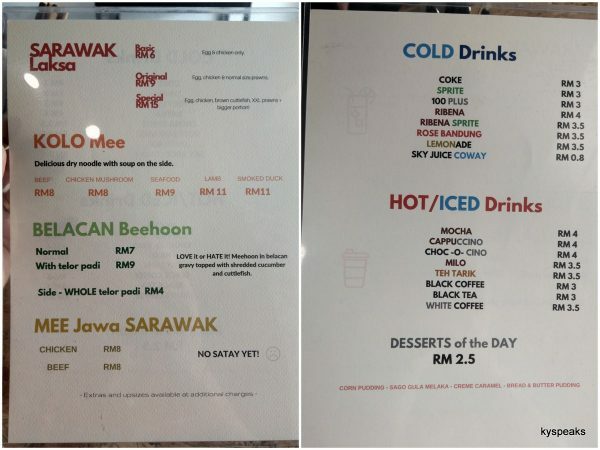 As it turns out SALTed does stand for something – Sarawak Authentic Local Taste Extra Delicious! The restaurant is located quite deep within Mutiara Damansara, and while it is perhaps only 5 minutes away from IKEA and Curve, you can’t really get there by walking from the big furniture shop. The Sarawak laksa comes in three different versions, basic (RM 6) comes with chicken stripes but no prawns, original (RM 9) comes with normal prawns, and special (RM 15) gets you some cuttlefish as well as three pretty large size sea caught “meng har” (明虾) prawns. 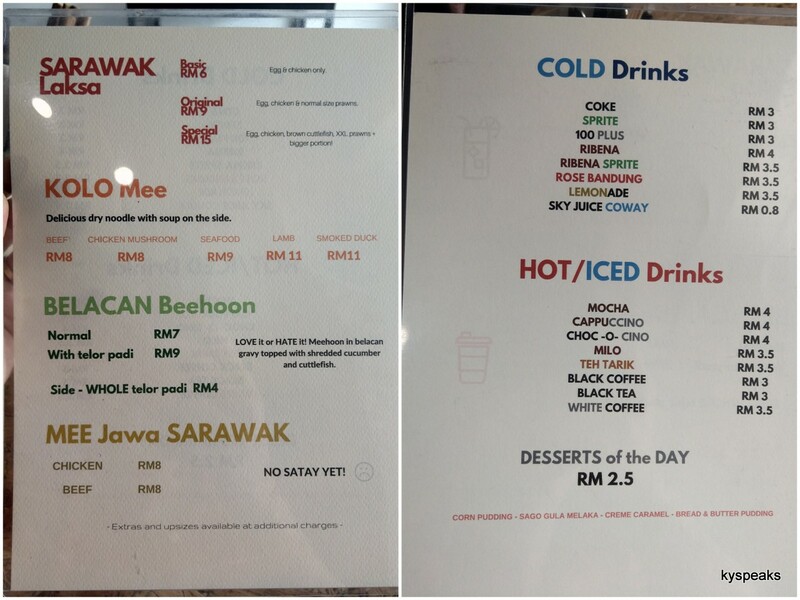 Other than laksa Sarawak, the restaurant also offers kolo mee, belacan meehun, and mee Jawa Sarawak. 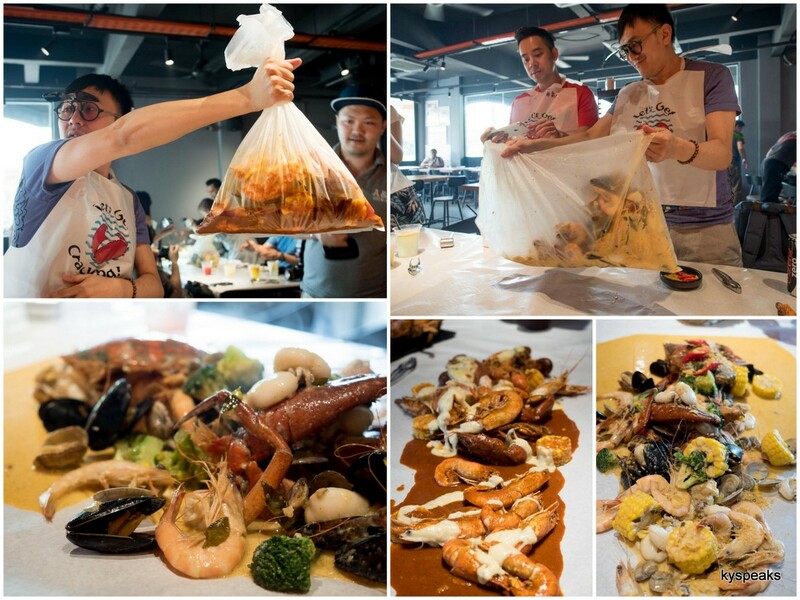 .My mission was only for the laksa, so no I did not try any of these dishes. 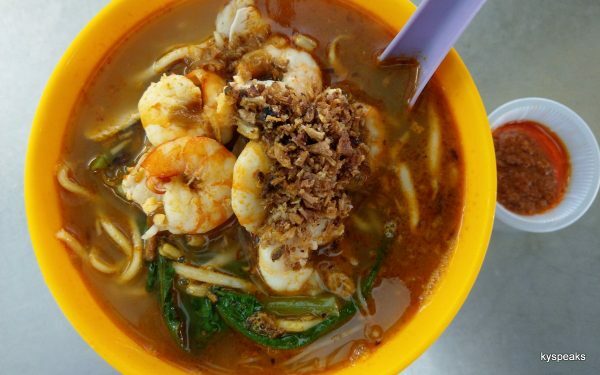 I first came across this new-to-me Penang Hokkien Prawn Mee stall from Lionel’s instagram feed. 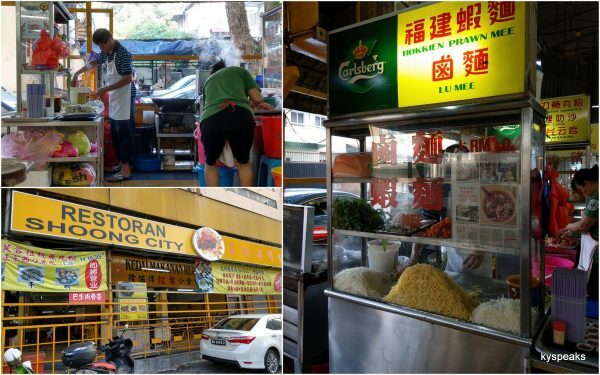 By the look of the picture as well as the trust I have Lionel as someone who knows his food as well as the link he provides (article on The Malay Mail written by Khang Yi of masak-masak), I knew then I had to visit this place the very next day, which I did. 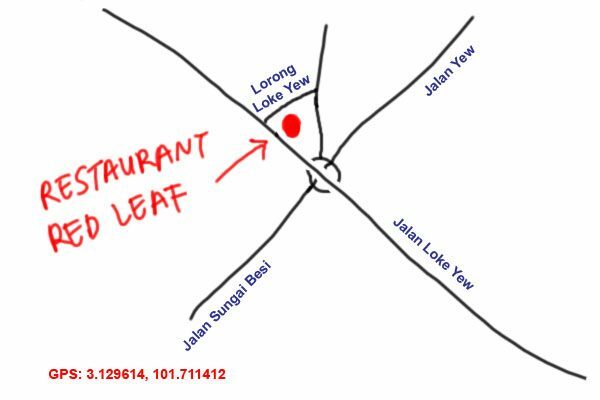 Restaurant Red Leaf is located at Restoran Red Leaf (also known as Restoran Shoong City?) 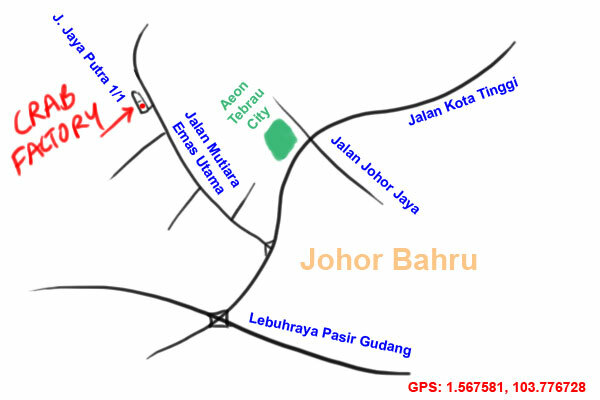 at the intersection of Jalan Loke Yew and Lorong Loke Yew. 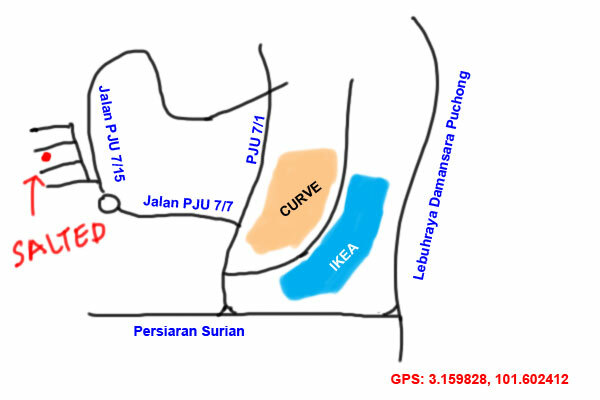 While being by the main road, it also manage to stay somewhat hidden from view, so do not miss your turning. The Hokkien Prawn mee stall is manned by the owner who’s been operating at the same spot for some 30 years and originally hailed from Penang. An easy test is to order a bowl in Penang Hokkien, which I almost always do when ordering Penang hawker food in Klang Valley. 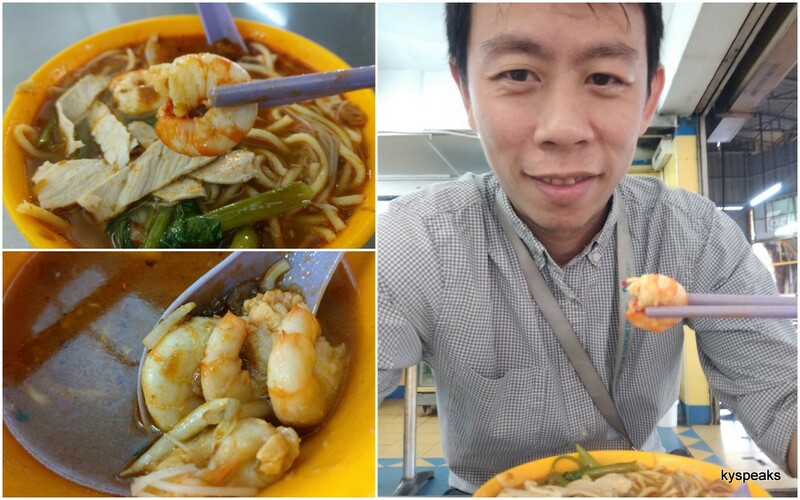 The usual small bowl goes for RM 6, but you can also have it with extra prawns for RM 9 each. Naturally that was what I went for. The prawn mee came with the usual ingredients of sea-caught prawns, kangkung, bean sprouts, pork slices, fried shallots, and your choice of yellow noodle, meehun, or both. 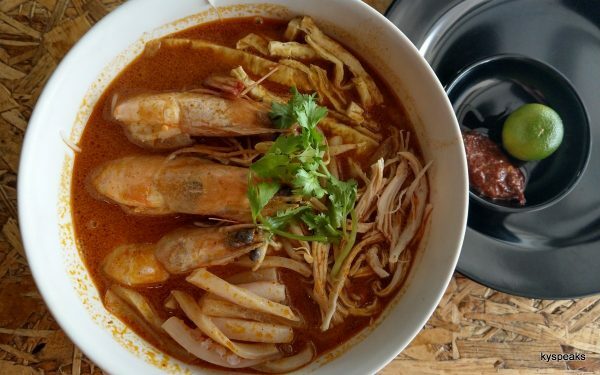 The broth carries a strong prawn note with a sweet seafood taste to it, with every ingredient jelled quite nicely to make a bowl of proper prawn mee that is my current favorite among the hawker offerings in Klang Valley. Will certainly make this one of my regular pre-work breakfast stops.